Onion allergy and remedies - What are the symptoms of an onion allergy? Although nearly any food can trigger an allergy, only eight foods (wheat, fish, shellfish, milk, peanuts, tree nuts, soy, and egg) account for 90% of all food-allergic reactions in the United States. About 3% of the US population is allergic to onions. A person is said to be allergic to a particular food if his body reacts in an undesirable manner every time he eats that food. In case of onion allergy, the immune system of the person reacts abnormally to the protein in onions. It identifies the protein as a dangerous substance and tries to destroy it. It produces antibodies called IgE, which react against the protein in the vegetable. To protect the body from this strange situation, an excessive amount of histamine is produced in the gut, pharynx, and skin. As the body reacts adversely to too much of histamine, the person starts sneezing or has skin rashes, sore throat, and watery eyes. This is described as an allergic reaction. It has been noticed that raw onions are more likely to cause an allergic reaction than cooked ones. Though, allergy to onions is not as common as peanut or shellfish allergy. Although the symptoms of onion allergy and intolerance are almost similar, allergy symptoms are usually noticed quickly, sometimes within a minute after consumption of onions. Sometimes, the reaction can be severe and life-threatening too. In case of onion intolerance, the reaction is relatively mild and slow. The person may suffer from stomach upset, stomach cramps, bloating, swelling of the face, diarrhea, etc. The symptoms may not be noticed immediately. They can even be noticed one day after consumption of onions. ✦ Anaphylaxis (rare): It is a rare (when it comes to onion allergy) but an acute reaction which seriously affects the breathing and heart rate of an individual. The person cannot breathe easily. His/her blood pressure drops and he/she faints. He or she may feel dizzy and may not be able to describe what is happening to himself/herself. It is a serious medical condition. ✦ In most cases, antihistamines help relieve the allergy symptoms in a short period of time. ✦ Over-the-counter antihistamines can be taken to get rid of mild symptoms. ✦ Doctors usually prescribe steroids for serious allergic reactions. As steroids come with serious side effects, instructions regarding dosage and the time period for which they are to be taken should be followed strictly. ✦ Those who have been diagnosed with onion allergy should always carry antihistamines with them. If they feel that the food consumed has triggered the allergy, then they should immediately take the medicine. ✦ Ointments and corticosteroids are helpful when the symptoms are limited to skin reactions like rashes or boils. ✦ Aloe vera gel, when applied topically, can help soothe the burning sensation on the skin. This is one of the best home remedies for skin rash. ✦ The allergy may aggravate the symptoms of asthma. One who experiences breathing difficulty after being exposed to onions can use an albuterol inhaler. It would help alleviate the symptoms. ✦ Foods like almonds can neutralize stomach acids and can help lower symptoms like heartburn and acid reflux. ✦ Avoiding onions would be the best treatment, as it would help eradicate the root cause of the allergy. 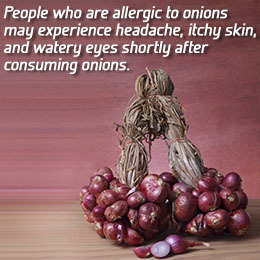 Those who are allergic to onions need to take precautions while choosing their food in restaurants or in supermarkets. They should read the labels or menu description carefully. ✦ Anaphylaxis, being a serious medical condition, one should seek immediate medical attention. An epinephrine injection should be immediately given to the person suffering from an anaphylactic shock. The following tests can be performed to find out the allergen or to confirm the diagnosis of onion allergy. Both children and adults can be allergic to onions. They can be allergic to garlic, chives, and other members of the Allium family too. Onions are widely used for cooking; it is added to soups, sauces, salads, curries, cheeses, vegetable juices, broth, stock, salad dressings, and various vegetarian and non-vegetarian dishes. People with such an allergy should always go through the list of ingredients. The degree of an allergic reaction may vary from person to person. It depends on how sensitive the person is to onions. Usually, the symptoms go away when the allergen is expelled from the body. But in a few hypersensitive individuals, they can last for days, even after the expulsion of onions from the body. according to research, accurate onion allergies are seldom seen. Approximately 3% of adults have been reported with this specific allergy. In contrast, more instances of onion intolerance are observed. The simple difference between an onion allergy as well as an onion intolerance is the fact that those who are intolerant to onions may eat the vegetable in minute quantities. In contrast, those allergic would not have the ability to withstand even its odour. We are now going to supply you with the symptoms that you would encounter if they are suffering from an onion allergy. This would allow you to spot your case easily. There are two kinds of allergic reactions into an onion, which include internal and external. The outside reactions occur when a direct contact with onion is made or owing to its smell. By comparison, an internal reaction stems from swallowing onion as part of the diet. 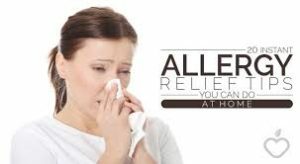 Before proceeding ahead and supplying you with an insight into the symptoms that manifest because of an onion allergy, we believe it prudent to say that allergic responses change as per people. Some experience instant reactions, while others, the signs might seem as late as 24 hours following the exposure. The intensity of the allergic reaction fluctuates as well. Some folks start to feel better after the triggering factor is removed. Rarely, the response could last for days, despite the onion being eliminated from the system. The entire spectrum would not be seen in each person. You may often see a combination of these symptoms in those suffering with an onion allergy. Now that we’ve shed some light about the signs and causes of an onion allergy, then let us proceed to discussing how to manage it. We will explore the prevention and also the course of action that you ought to take for the treatment of the allergy. The first important step when it comes to handling an onion allergy is the identification. If you have a suspicion that you are allergic to onions, you should get yourself examined. This would allow you to decide on your next course of action with ease. The analysis can be produced by means of a skin prick test, removal diet, and blood test. If you are diagnosed with an onion allergy, there are certain steps that you can take to make sure that you do not face any allergic reaction. The preventative steps can save you from a lot of trouble. The first thing that you should do when you’re allergy would be to refrain from eating fats. Preventing the triggering factor is your very best approach to deal with all forms of allergies, and this instance is no different. You ought to stay away from all forms of onion so as to be sure that you do not find yourself at the receiving end of any allergic reaction. Ensure you read food labels before purchase. You will need to be rather cautious with your diet plan. Conditions like natural seasoning and flavoring are an indication of the use of onions from the item, and so you’ll need to stay away from these types of products. If you eat out, ensure that you convey to the server there should be no kind of onion on your food. Be quite strict concerning this. It is not merely onions that you need to stay away from. Avoid all the food items which belong to the onion family. Antihistamines are rather effective in reducing allergies. They can easily be bought over the counter, so getting your hands on these wouldn’t prove to be a difficult job for you. Almonds neutralize the acids in the gut. Thus, reflux is decreased, which serves to decrease the heartburn symptoms that could be brought on by means of an onion allergy. You might also take advantage of aloe vera to acquire relief from the symptoms of swelling, burning, and itching. It will supply you with a calming effect. If you experiencing bloating, you can use bananas that would help in the process of digestion. In case you develop a strong reaction to onions, then you can use EpiPens. For those suffering from respiratory difficulties, an albuterol inhaler would end up being effective because it might alleviate the symptoms. Topical creams can be employed to deal with hives, rashes, and flakes. Nux vomica is a natural alternative that you could use to get relief in the digestive abnormalities which incur owing to this onion allergy. A response usually occurs when you eat onions or come in direct contact with you. Hence, the greatest treatment is to prevent onions altogether. When you build an allergic reaction and experience breathing difficulties which cannot be relieved by medications, don’t wait to rush into the hospital. Allergies may result in anaphylactic shocks, which can be deadly. Thus, do not take any chances and make certain prompt intervention is sought. Negligence can prove to be costly. 1 reason onions are bad for IBS is due to their fructans content. It has some healthy materials and nutrition in it. Because onions are located in virtually every savory preparation, in whole or powdered form, this makes a good deal of issues for those who suffer from it. If you suspect that you’re allergic to onions then you have to get a doctor check it out for you by conducting the suitable tests. Onions are among the most problematic foods for digestive wellness instead of only. It is the most common vegetable that is cultivated and eaten widely throughout the world. The sauce is a little spicy but very great. If you’ve already consumed mango intentionally or unknowingly then medication is the only means to go for. Mangoes are most likely the sweetest fruit on earth. Even after using these gloves by yourself or somebody who has peeled the mangoes for you, if you’re still feeling ill, then there isn’t any alternate to prevent mango containing food from diet forever. The guavas are also excellent home treatments for constipation. Servings are pathetic in comparison to the price. Overall it was an excellent meal! It is very important to keep in mind that not everyone responds the identical method to a food and, while there are those who tolerate onions well, in addition, there are those who can’t eat them because of the adverse effects they experience. Your next step must be to identify all the foods you can’t eat. Maintaining a healthful lifestyle by eating in small frequent proportions might help you to reduce the pressure on the intestine. Smoking may cause bile vomiting to an extent for the reason that it dries up body fluid together with saliva that’s crucial in cushioning and guarding the windpipe. Throwing up yellow bile is a terrible situation which you will experience in at least one time in your life. Before getting to understand how to quit vomiting bile, it’s much better to learn about the causes that lead it to take place. Throwing up yellow bile can happen in bouts or for a very long time period, so even you’re experiencing slight, moderate or life-threatening signs of this disease, the ideal alternative for you is to pay a visit to your physician and ask them for reliable advice. Intestinal blockage can be extremely dangerous if you don’t locate any remedy to handle it immediately. The reason behind prostatitis is also intricate. The indications of onion allergy are extremely similar to the majority of other allergies. When you experience these symptoms, it is wise for you to go to your physician for reliable advice. There are symptoms that exist on the epidermis, and discomfort in the digestive tract. All these pains are the result of long sitting. If you don’t wish to suffer from stomach pain or nausea that is normally accompanied with the vomiting, you need to stave off dehydration and prevent whatever makes it worse. The skin dermatitis, inflammation, hives are a few of the most frequent skin problems as a consequence of it. Interestingly, people who suffer from this allergy also generally have difficulties with garlic since both of these vegetables belong to exactly the same plant family. Onion allergies are caused as a result of hypersensitivity of a man or woman to the substances present inside this vegetable. Patients over age 70 ought to be mindful of the chance of concurrent prostate cancer. A health care provider will do these tests to verify your hypersensitivity to onions. In that situation, the ideal method is to go to a physician and request a medical test. Your physician will advise you regarding the right medication based on the seriousness of your symptoms. Patients with persistent urinary frequency symptoms ought to be examined in detail to get rid of the chance of urinary tuberculosis. For this reason, you have to keep the most suitable medication handy. It assists in giving the correct treatment at the true moment. The treatment for mango allergy ought to be taken right after detecting it correctly. If you’ve got severe allergic attacks then your physician might prescribe you an epinephrine injection so that it is possible to arrest the attack before it will become lethal. From time to time, it can be not accepted and accompanied with a quick and forceful reaction like vomiting. On rare occasions, it may also end up being a deadly reaction. The allergic reaction isn’t deadly, but the anaphylactic shock might occur in hardly any scenarios. One of the consequent sulfur compounds is syn-Propanethial S-oxide that’s additionally a tear-causing agent and among the key reasons onions make you cry. The chemical is liable for ivy rash too. Castor oil may also be taken when you’re in dire straits and wishing your bowels would get cleared.